Spacious bungalow with 3 bedrooms and 2 bathrooms, sleeps 6. Classification house, through spacious hall to large kitchen with fireplace, and cozy living room. Three spacious bedrooms with sliding doors to terrace and two bathrooms. The house has a beautiful palm garden and is completely walled for optimum privecy. Entrance Casa Palmera, through automatically operated gate, parking for 2 cars. The holiday house was recently renovated in 2009, there is a good outdoor lighting and alarm system. The location is 300 meters. from the center village. Post office, shops, pharmacy and cafe are within walking distance. Each bathroom has a heated towel rail / radiator and hair hairdryer The large bathroom has a washing machine. There are towels and bath linen. The pool is dim. 10 m x 5 m, max. 2 m deep. The pool has a saltwater system, steps in front of and behind a stainless steel ladder, and there is an outdoor shower. 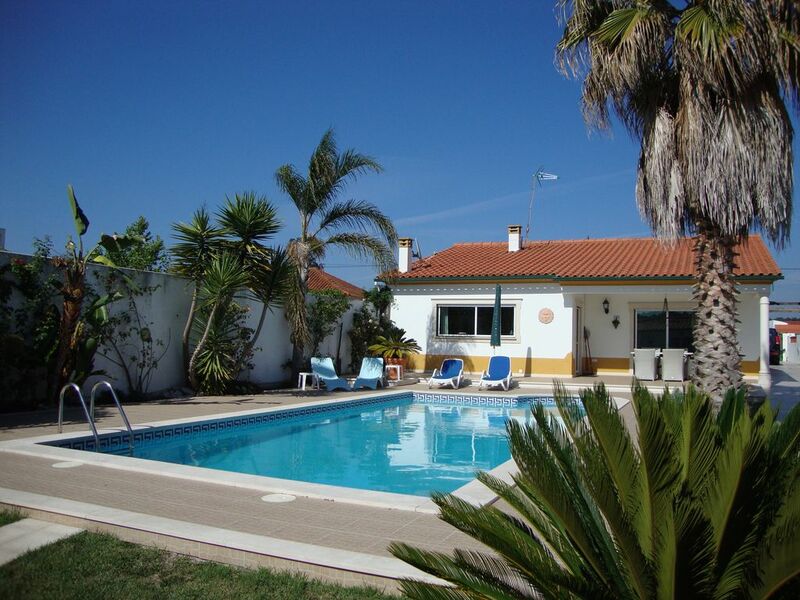 The pool and house Casa Palmera entirely private for tenant use. The bungalow kitchen is fully equipped, also has a blender, the outdoor kitchen has a built-in stainless steel BBQ with all possibilities. There is everywhere a good wifi internet connection. Prachtige centraal gelegen villa in rustige omgeving dichtbij het strand. Mijn gezin met 2 kinderen en mijn schoonouders hebben enorm genoten van de prachtige ruime en zeer kompleet ingerichte villa, Heerlijk zwembad met ligstoelen en douche. De aparte BBQruimte was ook fijn kompleet. Yolande en Sietse waren zeer behulpzaam en goed bereikbaar voor het geven van tips over de omgeving, Portugal, enz. Echt een aanrader voor een gezin dat even wil genieten van elkaar, de luxe en de rust. Yolande en Sietse: hartelijk dank voor jullie gastvrijheid en het gebruik van de prachtige villa. Vriendelijke groet van Ton Hopmann + gezin. La villa et la piscine sont parfaites pour un séjour en famille il ne manque rien. Les propriétaires sont agréables et discret mais disponible, à notre arrivée un plateau de bienvenue était à notre disposition. Mediterranean holiday house Casa Palmera, surrounded by forest and dunes, is 6 km away from the beautiful beaches with Blue Flag Eco, guarantees the most beautiful and cleanest beaches of central Portugal. Through the new car and bicycle route through the woods and dunes Rua do Atlantico, you can easily reach Nazere, and other fun praias, there is also close to a beautiful natural lake in the woods. The central location of Casa Palmera are you so via the A17 to all UNESCO sites, Alcobaca, Batalha, Tomar, Fatima and Obidos. In nearby Leiria is an ultra modern shopping center, restaurants and lively markets. Waarborg som wordt gevraagd €150, te betalen bij aankomst. Bij voor- en na seizoen bij gebruik centrale verwarming ,extra kosten voor gas, betaling bij vertrek. Wi-Fi internet is gratis. Schoonmaak kosten inbegrepen huurprijs. Aanbetaling bij reservering 25%. Restant betaling te voldoen 75%, 8 weken voor aankomst. Gasten wordt geadviseerd om een annuleringsverzekering aftesluiten. Wij accepteren geen groepen jongeren - aub bij aanvraag meedelen. Damage deposit is 150€, to be paid at arrival. In the low season central heating is not included, extra costs for gas, payment at check-out. Checkin time Saturday from 4pm, checkout before 11am. Wi-Fi is free. Cleaning is included. Down payment is 25%. Rest payment of 75% has to be done 8 weeks before arrival. We advise our guests to effect a cancellation insurance. We do not accept a group of adolescents - please let us know when you inquire.